I saw this effect a few years ago and finally got around to trying it yesterday. I love them! 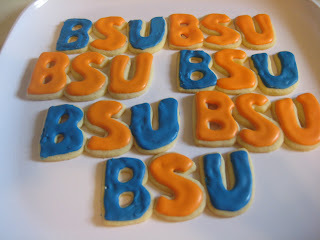 I have a letter cookie cutter set and couldn't resist making some cookies for my alma mater. We'll eat them during the game this week. Go Cougars! 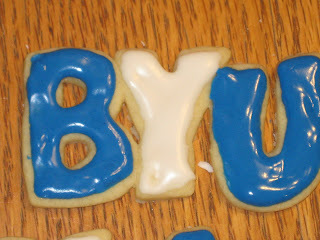 I cut out the letters separately and then squish them together a little before I bake them on the cookie sheet. 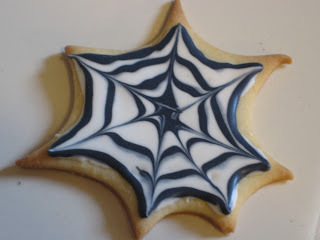 They come out as one cookie. 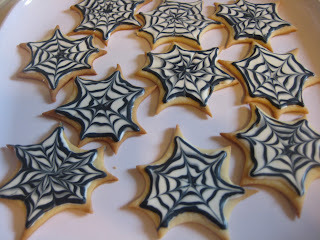 Just let them cool and then add some royal icing. They're shiny when wet, but dry in a couple of hours. A little shout out to the mother land. Dad, I would seriously mail these to you if I knew they would get there in time for the game, but I think it will be too late. Maybe for the BCS bowl game...? :) If you know the top teams in collegiate football this season, you will know that I am VERY happy with my teams this year. Go Broncos! What a super cute idea! 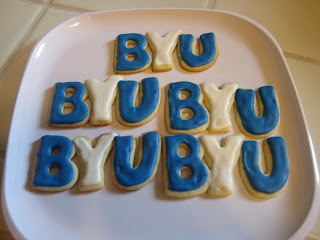 I love the BYU/BSU cookies and my husband would die if I ever made BYU cookies for him! He'd love it! You've inspired me to be creative...if I can get a shower in and my kid dressed. We're still in the adjustment phase! I'm so proud of the cougs too! I'm nervous for tonight's game though. We'll keep our fingers crossed!